Many people would prefer not to have to clean their own floors. They would prefer to hire someone to do that work for them whether it is the basement, the kitchen or all of the floors in their home. Usually people will hire professional companies to come and clean all their floors and wash all of the rugs. It saves them a lot of time and they do not need to do the work that is involved in shampooing floors. It really is just that they do not want to make the effort to do some work and save themselves a bit of money. As with rugs, special precautions should be taken to ensure that the detergent that is being used will not harm your rug or discolor the rug. Usually people remove all of the furniture to make sure that the rug is not stained in any way from the feet of the furniture sitting on a wet rug. Allow your right to dry before placing any furniture on it or using the rug or walking on it. When it comes to hardwood floors, special precautions should be taken to ensure that a mild soap detergent is used and that no water or liquid is left on the floor. Any excess liquid can harm your floor and cause the floor to buckle after it swells from absorbing the moisture. In addition, depending on the liquid, it may also stain the floor. Immediately wipe up any liquid that spills on the floor. Don’t forget droplets that may be left over after washing the hardwood floor. 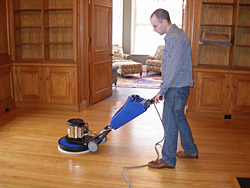 Before washing the floor whether it is a hardwood floor or a rug, be sure to vacuum the floor. Remove all loose dirt and grit that maybe on the floor. This will ensure that your cleaning will do a much better job on both kinds of flooring. Your floors will last much longer than they would otherwise. In the end this saves a great deal of money. If you really do not want to have to clean or refinish your flooring often, remove all shoes at the front door. Vacuum often to remove all grit that may be brought into the house. This grit can act like sand paper and remove the shine from your floor. Over time your floor will have a dull looking finish. It may require a complete re-sanding and refinishing to regain that shiny new look. Your floors will last much longer if you take care of them. They will look better and the cost of refinishing your floors will be deferred well into the future. Take care of your floors regardless of whether they are carpet, linoleum or hardwood. This will reduce your annual maintenance costs.